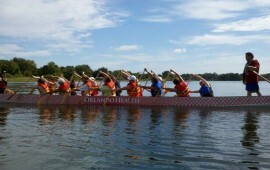 Stay up to date with the Orlando Dragon Boat Club’s regular meetups! Many current and aspiring members attend the weekly (or biweekly) meetups to get in shape, meet new people, and enjoy the comradery of dragon boating. For more information on the next meetup, join our meetup page for the Orlando Dragon Boat Club! If you’ve never paddled, feel free to sign up for the weekly “learn to paddle” sessions. It’s like taking the bunny slope before skiing down the diamond slopes. *All memberships, except non-resident membership, are yearly starting January through December. Except for the non-resident membership, you may pay entire cost up front or half now and half in six months (final half would be invoiced to you when month sixth is approaching). The ORC-DBC recommend that you consult your physician prior to participating in this activity as it may be too strenuous for certain individuals and as such, your physician should determine whether dragon boating is appropriate for you. member or organizer of dragon boat events for any injury, damage, or loss sustained during activities. I agree on behalf of myself, my heirs, my personal representative and executors, to allow any photographs/videos taken of me for use in publicity and promotional efforts. I hereby agree by my signature below, and in consideration of ORC-DBC allowing me to utilize ORC-DBC equipment, participate in ORC-DBC functions including club programs and festivals or otherwise participate in the paddling experience in any way related to, under or through ORC- DBC, and other good and valuable consideration, receipt and adequacy of which is hereby acknowledged, to be bound by and faithfully obey the ORC-DBC Equipment and all other Policies and Procedures and the ORC-DBC Code of Conduct, as they may exist now and as they may be adopted or changed in the future by the ORC Board of Directors in its sole discretion. I have read this agreement, fully understand its terms, understand that I have given up substantial rights by signing it and have signed it freely and without any inducement or assurance of any nature and intend it to be a complete and unconditional release of all liability to the greatest extent allowed by law and agree that if any portion of this agreement is held to be invalid, the balance, notwithstanding, shall continue in full force. If applicant is under the age of 18, a parent or legal guardian must sign this form.